Mr. James has been an underground secret. During his many years as a professional he refused to lecture for magicians or publish the effects he used in his professional performances. Now, Mr. James has largely retired from performing and has begun to lecture for magicians. 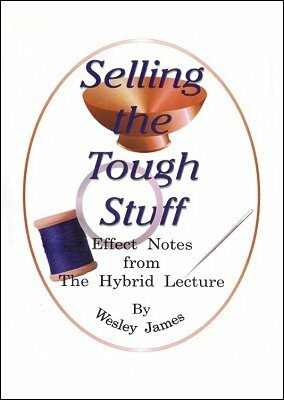 Selling the Tough Stuff are the lecture notes from his 2nd lecture series. Larry Jennings, Ken Krenzel, Jim Patton and Gordon Bruce would agree. They all attended his past lecture. Brownian Movement - For the first time in print, a breath-taking presentation of the E.G. Brown "Wandering Card" plot. MacMillan Unmoved - The lead-in to a gambling skill/magic set where he apparently deals 5ths, 4ths, 3rds and 2nds. Too Much Ambition - The second, magic phase of the routine, including Wesley's version of Dingle's "Too Many Cards." Presbyopia - A needle penetration effect that offers tribute to Amedeo Vacca, a former assistant to Houdini. No set of Notes can replicate the experience of attending a Wesley James lecture, but these notes bring his thinking and style to the reader with the next best thing to that performance-changing opportunity. Fully illustrated in 45 packed pages. 1st edition 2003, 45 pages.